Beijing Mobike Technology Co. and Beijing Bikelock Technology Co. (trading as Ofo) require users to pay a surety upfront for the right to rent. With millions of users on their books, that translates into billions of dollars of cash on hand. Mobike claims to have 100 million users, and it requires a 299 yuan ($45) deposit. That means it has just shy of 30 billion yuan, or $4.5 billion, in cash. That's four times the amount VCs have thrown at it. China's bike rental companies Mobike and Ofo are in talks to merge. There's not a sane mind in the world who doesn't think that's a good idea. One parallel is the merger of Didi Dache and Kuaidi Dache to form Didi Chuxing, which then eventually folded in Uber China. They are, of course, extremely different businesses. Car-sharing companies generally don't own inventory. This means they're not spending buckets of money buying assets that get piled up like trash on sidewalks, nor do they have to worry about huge maintenance costs. And while they do dish out vast sums subsidizing drivers to get them to use the platform, rider-driver hookup services charge the consumer more than a token fee. 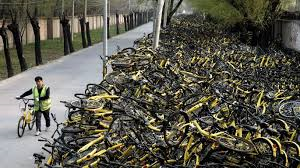 Despite purchasing bikes by the ton -- Ofo and Mobike have more than 13 million combined -- they hardly charge anything for rental, making outsiders scratch their heads at how this can possibly make sense. Note: Doesn't include interim rounds for which data hasn't been disclosed. But there is one factor ride-sharing companies don't enjoy: deposits. Beijing Mobike Technology Co. and Beijing Bikelock Technology Co. (trading as Ofo) require users to pay a surety upfront for the right to rent. With millions of users on their books, that translates into billions of dollars of cash on hand. Note: Series B funding is unknown. There has also been interim rounds for which amounts haven't been disclosed. Let's run the numbers. Mobike claims to have 100 million users, and it requires a 299 yuan ($45) deposit (let's assume this surety is similar in all markets). That means it has just shy of 30 billion yuan, or $4.5 billion, in cash. That's four times the amount VCs have thrown at it. The deposit pile at Ofo comes in at around 2 billion yuan, a lot less because it has fewer users and demands a smaller bond. It also allows deposit-free rental for some with a good Sesame Credit score. Compare the combined $4.8 billion of deposit money with the $2.3 billion CB Insights estimates the duo have raised through outside funding and you realize that in reality, the unwitting venture capitalists in all of this are actually China's millions of bike riders. With only 7 million bikes but 100 million users, Mobike holds 4,200 yuan cash per bike. Ofo's numbers aren't anywhere near as favorable. In theory, such funds are like callable deposits, but in reality, the process is a little more cumbersome --- most users won't bother asking for their money back because they plan to keep renting bikes. Executives from both rental companies have said publicly that this cash isn't being used to buy extra bikes or fund operations. I have no way of fact checking such an assertion, but assuming that it's true, this would be the smartest move possible. Note: Ofo allows users in some cities to skip a deposit if they have a good enough credit score. Instead of frittering away 32 billion yuan on unprofitable assets such as bicycles, the companies can easily funnel those funds into money markets and other investments that earn around 4 percent annually. It may not make up for the billions burnt on bikes and operations, but babysitting cash is one easy way to make a dime.